RS Aggarwal (2015) Solutions for Class 10 Math Chapter 18 Area Of Circle, Sector And Segment are provided here with simple step-by-step explanations. These solutions for Area Of Circle, Sector And Segment are extremely popular among class 10 students for Math Area Of Circle, Sector And Segment Solutions come handy for quickly completing your homework and preparing for exams. All questions and answers from the RS Aggarwal (2015) Book of class 10 Math Chapter 18 are provided here for you for free. You will also love the ad-free experience on Meritnation’s RS Aggarwal (2015) Solutions. All RS Aggarwal (2015) Solutions for class 10 Math are prepared by experts and are 100% accurate. Find the circumference and the area of a circle of diameter 35 cm. The circumference of a circle is 39.6 cm. Find its area. The area of a circle is 301.84 cm2. Find its circumference. The difference between the circumference and the radius of a circle is 37 cm. Find the area of the circle. Let the radius of the circle be r cm. A copper wire when bent in the form of a square encloses an area of 484 cm2. The same wire is not bent in the form of a circle. Find the area enclosed by the circle. Now, let the radius of the circle be r cm. Thus, the area enclosed by the circle is 616 cm2. A wire when bent in the form of an equilateral triangle encloses an area of 1213cm2. The same wire is bent to form a circle. Find the area enclosed by the circle. The length of a chain used as the boundary of a semicircular park is 90 m. Find the area of the park. Let the radius of the park be r m.
The sum of the radii of two circles is 7 cm, and the difference of their circumferences is 8 cm. Find the circumference of the circles. Let the radii of the two circles be r1 cm and r2 cm. Therefore, circumferences of the first and second circles are 18 cm and 26 cm, respectively. The areas of two concentric circles are 962.5 cm2 and 1386 cm2. Find the width of the ring. Let the radii of the bigger and smaller circles be R cm and r cm, respectively. 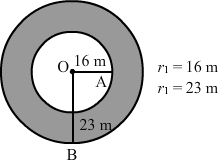 Find the area of a ring whose outer and inner radii are respectively 23 cm and 12 cm. Let r1 cm and r2 cm be the radii of the outer and inner boundaries of the ring, respectively. A path of 8 m width runs around the outsider of a circular park whose radius is 17 m. Find the area of the path. The radius (r) of the inner circle is 17 m.
The inner circumference of a circular track is 440 m, and the track is 14 m wide. Calculate the cost of levelling the track at 25 paise/m2. Also, find the cost of fencing the outer boundary of the track at Rs 5 per metre. Let the radius of the inner circle be r m.
We know that the track is 14 m wide. A race track is in the form of a rig whose inner circumference is 352 m and outer circumference is 396 m. Find the width and the area of the track. Let r m and R m be the radii of the inner and outer tracks. A park is in the form of a rectangle 120 m by 90 m. At the centre of the park there is a circular lawn as shown in the figure. The area of the park excluding the lawn is 2950 m2. Find the radius of the circular lawn. Thus, the radius of the circular lawn is 50 m.
In the given figure, AB is a diameter of a circle with centre O and OA = 7 cm. Find the area of the shaded region. OA is the radius of the circle. OA is the diameter of the smaller circle. 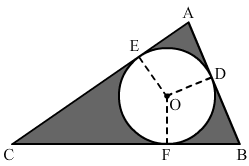 In the given figure, O is the centre of the bigger circle, and AC is its diameter. Another circle with AB as diameter is drawn. 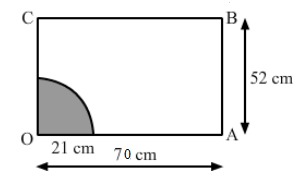 If AC = 54 cm and BC = 10, find the area of the shaded region. 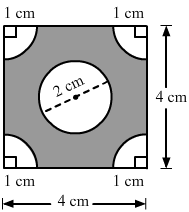 AB is the diameter of the smaller circle. PQRS is a diameter of a circle of radius 6 cm. The lengths PQ, QR and RS are equal. 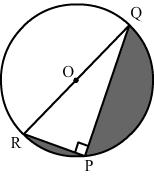 Semicircles are drawn with PQ and QS as diameters, as shown in the given figure. If PS = 12 cm, find the perimeter and area of the shaded region. For the arc PTS, radius is 6 cm. For the arc QES, radius is 4 cm. For the arc PBQ, radius is 2 cm. The inside perimeter of a running track shown in the figure is 400 m. The length of each of the straight portions is 90 m, and the ends are semicircles. If the track is 14 m wide everywhere, find the area of the track. Also, find the length of the outer boundary of the track. Therefore, the length of the outer boundary of the track is 488 m and the area of the track is 6216 sq. 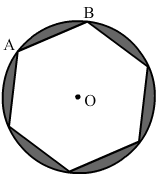 m.
In the given figure, OPQR is a rhombus, three of whose vertices lie on a circle with centre O. If the area of the rhombus is 323, find the radius of the circle. In a rhombus, all sides are congruent to each other. Similarly, ∆QOR is also equilateral and ∆QOP ≅ ∆QOR. Hence, the radius of the circle is 8 cm. The side of a square is 10 cm. Find (i) the area of the inscribed circle, and (ii) the area of the circumscribed circle. (​i)​ If a circle is inscribed in a square, then the side of the square is equal to the diameter of the circle. (ii) If a circle is circumscribed in a square, then the diagonal of the square is equal to the diameter of the circle. If a square is inscribed in a circle, then the diagonals of the square are diameters of the circle. Let the diagonal of the square be d cm. Thus, the ratio of the area of the circle to that of the square is π:2. The area of a circle inscribed in an equilateral triangle is 154 cm2. Find the perimeter of the triangle. Let the radius of the inscribed circle be r cm. In a triangle, the centre of the inscribed circle is the point of intersection of the medians and altitudes of the triangle. The centroid divides the median of a triangle in the ratio 2:1. Let the altitude be h cm. Let each side of the triangle be a cm. The radius of the wheel of a vehicle is 42 cm. How many revolutions will it complete in a 19.8-km-long journey? The wheels of the locomotive of a train are 2.1 m in radius. They make 75 revolutions in one minute. The wheels of a car make 2500 revolutions in covering a distance of 4.95 km. Find the diameter of a wheel. A boy is cycling in such a way that the wheels of his bicycle are making 140 revolutions per minute. If the diameter of a wheel is 60 cm, calculate the speed (in km/h) at which the boy is cycling. Hence, the speed at which the boy is cycling is 15.84 km/h. The diameter of the wheels of a bus is 140 cm. How many revolutions per minute do the wheels make when the bus is moving at a speed of 72.6 km per hour? Hence, the wheel makes 275 revolutions per minute. A horse is placed for grazing inside a rectangular field 70 m by 52 m. It is tethered to one corner by a rope 21 m long. On how much area can it graze? How much area is left ungrazed? The shaded portion shows the part of the field the horse can graze. A horse is tethered to one corner of a field which is in the shape of an equilateral triangle of side 12 m. If the length of the rope is 7 m, find the area of the field which the horse cannot graze. Write the answer correct to 2 places of decimal. Four equal circles are described about the four corners of a square so that each touches two of the others, as shown in the figure. Find the area of the shaded region, if each side of the square measures 14 cm. 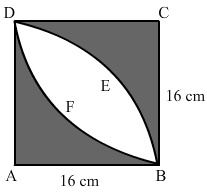 Find the area of the shaded region shown in the given figure. The four corners are circle quadrants, and at the centre, there is a circle. A rectangular piece is 20 m long and 15 m wide. From its four corners, quadrants of radius 3.5 m have been cut. Find the area of the remaining part. Four cows are tethered at the four corners of a square field of side 50 m such that each can graze the maximum unshared area. What area will be left ungrazed? Each cow can graze a region that cannot be accessed by other cows. In the given figure, AOBC represents a quadrant of a circle of radius 3.5 cm with centre O. Calculate the area of the shaded portion. In the given figure, PQRS represents a flower bed. If OP = 21 m and OR = 14 m, find the area of the flower bed. Area of the flower bed is the difference between the areas of sectors OPQ and ORS. Three equal circles, each of radius 6 cm, touch one another as shown in the figure. Find the area of enclosed between them. Join ABC. All sides are equal, so it is an equilateral triangle. If three circles of radius a each, are drawn such that each touches the other two, prove that the area included between them is equal to 425a2. When three circles touch each other, their centres form an equilateral triangle, with each side being 2a. Four equal circles, each of radius 5 cm, touch each other, as shown in the figure. Find the area included between them. All sides are equal, so it is a square. Four equal circles, each of radius a units, touch each other. Show that the area between them is 67a2 sq units. When four circles touch each other, their centres form the vertices of a square. The sides of the square are 2a units. A square tank has an area of 1600 m2. There are four semicircular plots around it. Find the cost of turfing the plots at Rs 1.25 per m2. A lawn is rectangular in the middle, and it has semicircular portions along the shorter sides of the rectangle. The rectangular portion measures 50 m by 35 m. Find the area of the lawn. A rope by which a cow is tethered is increased from 16 m to 23 m. How much additional ground does it have now graze? In the given figure ∆ABC is right-angled at A, with AB = 6 cm and AC = 8 cm. 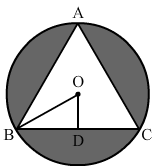 A circle with centre O has been inscribed inside the triangle. Find the value of r, the radius of the inscribed circle. Join OC, OA and OB. This gives triangles OAC, OAB and OCB. A child draws the figure of an aeroplane as shown. 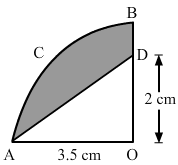 Here, the wings ABCD and FGHI are parallelograms, the tail DEF is an isosceles triangle, the cockpit CKI is a semicircle and CDFI is a square. In the given figure, BP ⊥ CD, HQ ⊥ FI and EL ⊥ DF. If CD = 8 cm, BP = HQ = 4 cm and DE = EF = 5 cm, find the area of the whole figure. Find the area of the region ABCDEFA shown in the given figure, given that ABDE is a square of side 10 cm, BCD is a semicircle with BD as diameter, EF = 8 cm, AF = 6 cm and ∠AFE = 90°. Now, AEDB is a square. In the given figure, ABCD is a square of side 14 cm. Find the area of the shaded region in the given figure. Find the perimeter of the shaded region, where ADC, AEB and BFC are semicircles on diameters AC, AB and BC respectively. For the arc ADC, radius is 2.1 cm. For the arc AEB, radius is 1.4 cm. For the arc BFC, radius is 0.7 cm. In the given figure, ∆ABC is right-angled at A. Semicircles are drawn on AB, AC and BC as diameters. It is given that AB = 3 cm and AC = 4 cm. Find the area of the shaded region. In the given figure, PQ = 24, PR = 7 cm and O is the centre of the circle. Find the area of the shaded region. 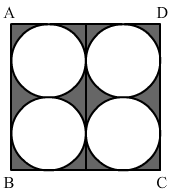 A round table cover has six equal designs as shown in the given figure. If the radius of the cover is 35 cm, then find the total area of the design. Join each vertex of the hexagon to the centre of the circle. The hexagon is made up of six triangles. In the given figure, ∆ABC is right-angled at A. Find the area of the shaded region if AB = 6 cm, BC = 10 cm and O is the centre of the incircle of ∆ABC. Now, we must find the radius of the incircle. Draw OE, OD and OF perpendicular to AC, AB and BC, respectively. Because the circle is an incircle, AE and AD are tangents to the circle. Therefore, AEOD is a square. Thus, we can say that AE=EO=OD=AD=r. The area of an equilateral triangle is 493 cm2. 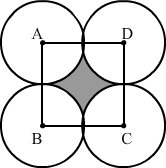 Taking each angular point as centre, circle as drawn with radius equal to half the length of the side of the triangle. Find the area of the triangle not included in the circles. Let the side of the equilateral triangle be a cm. The radius of each circle is 7 cm. The angle at the vertex of each triangle is 60°. There are three such sectors. In the given figure, ∆ABC is a right-angled triangle with ∠B = 90°, AB = 48 cm and BC = 14 cm. With AC as diameter a semicircle is drawn and with BC as radius, A quadrant of a circle is drawn. Find the area of the shaded region. Calculate the area other than the area common between two quadrants of circles of radius 16 cm each, which is shown as the shaded region in the given figure. In a circular table cover of radius 70 cm, a design is formed leaving an equilateral ∆ABC in the middle, as shown in the figure. Find the total area of the design. OB bisects ∠B. Therefore, ∠OBD=30°. 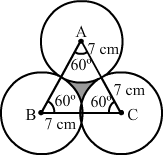 ∆OBD is a right-angled triangle. Find the area of the sector of a circle of radius 14 cm with central angle 45°. 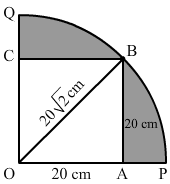 A sector is cut from a circle of radius 21 cm. The angle of the sector is 150°. 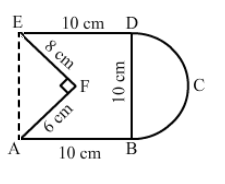 Find the length of the arc and the area of the sector. The radius of a circle is 17.5 cm. Find the area of the sector enclosed by two radii and an arc 44 cm in length. The perimeter of a certain sector of a circle of radius 6.5 cm in 31 cm. Find the area of the sector. Let O be the centre of the circle with radius 6.5 cm and OACBO be its sector with perimeter 31 cm. The area of the sector of a circle of radius 10.5 cm is 69.3 cm2. Find the central angle of the sector. A pendulum swings through an angle of 30° and describes an arc 8.8 cm in length. Find the length of the pendulum. 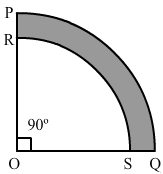 The length of an arc of a circle, subtending an angle of 54° at the centre, is 16.5 cm. Calculate the radius, circumference and area of the circle. The circumference of a circle is 88 cm. Find the area of the sector whose central angle is 72°. Area of the sector = ? The minute hand of a clock is 15 cm long. Calculate the area swept by it in 20 minutes. A sector of 56°, cut out from a circle, contains 17.6 cm2. Find the radius of the circle. A circular disc of radius 6 cm is divided into three sectors with central angles 90°, 120° and 150°. What part of the whole circle is the sector with central angle 150°? Also, calculate the ratio of the areas of the three sectors. The short and long hands of a clock are 4 cm and 6 cm long respectively. Find the sum of distances travelled by their tips in 2 days. In 2 days, the short hand will complete 4 rounds. In the same 2 days, the long hand will complete 48 rounds. Find the lengths of the arcs cut off from a circle of radius 12 cm by a chord 12 cm long. Also, find the area of the minor segment. Let AB be the chord. Joining A and B to O, we get an equilateral triangle OAB. The radius of a circle with centre O is 6 cm. Two radii OA and OB are drawn at right angles to each other. Find the areas of the minor and major segments. The triangle OAB is a right isosceles triangle. A chord 10 cm long is drawn in a circle whose radius is 52 cm. Find the areas of both the segments. Let O be the centre of the circle and AB be the chord. Thus, ∆OAB is a right isosceles triangle. Find the areas of both the segments of a circle of radius 42 cm with central angle 120°. Here, R is the measure of the equal sides of the isosceles triangle and θ is the angle enclosed by the equal sides. A chord of a circle of radius 30 cm makes an angle of 60° at the centre of the circle. Find the areas of the minor major segments. Let the chord be AB. The ends of the chord are connected to the centre of the circle O to give the triangle OAB. In a circle of radius 10.5 cm, the minor arc is one-fifth of the major arc. Find the area of the sector corresponding to the major arc. The diameters of the front and rear wheels of a tractor are 80 cm and 2 m respectively. Find the number of revolutions that a rear wheel makes to cover the distance which the front wheel covers is 800 revolutions. Let the radius be r m.
Let the radius be r cm. Let r1 cm and r2 cm be the radii of the two circles. Hence, the ratio of the areas of the two circles is 4:9. Let d be the original diameter. Let r be the original radius. Let a be the side of the square. Let r1 and r2 be the radii of the two circles. Hence, the ratio of their circumferences is 2:3. Now, let the diameter of the wheel be d m.
The diameter of a wheel is 40 cm. How many revolutions will it make in covering 176 m? The radius of a wheel is 0.25 m. How many revolutions will it make in covering 11 km? Let r cm be the radius of the new circle. If the perimeter of a square is equal to the circumference of a circle, then the ratio of their areas when π=227 is. Let P be the perimeter of the square. Let r be the radius of the circle and θ be the angle. Let AB be the chord of a circle with centre O. Let r cm and R cm be the radii of two concentric circles. (a) Let r be the radius of the circle. (b) Let r be the radius of the circle. (c) Let r be the radius of the circle whose circumference is equal to the sum of the circumferences of the given circles. (d) Let r be the radius of the circle with area equal to the sum of the areas of the given circles. 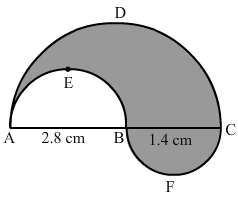 a circle of radius 5.6 cm is 27.2 cm. (b) Draw OD such that OD⊥AB. (d) Let O be the centre of the circle of radius 5.6 cm and OACB be its sector with perimeter 27.2 cm. revolutions in covering 11 km. of a circle of radius 10.5 cm. Let the radius of the protractor be r cm. Let the diameter of the wheel be d m.
The area of the quadrant of a circle having a circumference of 22 cm is 958cm2. The area of a sector of a circle of radius r with central angle x° is x×πr2360. (a) Both Assertion (A) and Reason (R) are true and Reason (R) is a correct explanation of Assertion (A). (b) Both Assertion (A) Reason (R) true but Reason (R) is not a correct explanation of Assertion (A). (a) Both assertion (A) and reason (R) are true and reason (R) is the correct explanation of assertion (A). Hence, assertion (A) is true. Assertion (A) is true and reason (R) is the correct explanation of assertion (A). An arc of a circle of length 5π cm bounds a sector whose area is 20π cm2. Then, the radius of the circle is 4 cm. A chord of a circle of radius 12 cm subtends an angle of 60° at the centre of the circle. 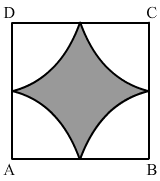 The area of the minor segment of the circle is 13.08 cm2. Hence, assertion (A) is false. Hence, reason (R) is true. If the circumferences of two circles are in the ratio 2 : 3, then the ratio of their areas is 4 : 9. The circumference of a circle of radius r is 2πr. (b) Both assertion (A) and reason (R) are true, but reason (R) is not the correct explanation of assertion (A). Let r1 and r2 be the radii of two circles. Hence, the ratio of their areas is 4:9. Hence, both assertion (A) and reason (R) are true, but reason (R) is not the correct explanation of assertion (A). Now, OB is the radius of the circle. Hence, the radius of the circle is 202 cm. The diameter of a wheel is 84 cm. How many revolutions will it make to cover 792 m? Let d cm be the diameter of the wheel. The area of a sector of a circle with radius r making an angle of x° at the centre is x360×πr2. All options are incorrect; the correct answer is 30.5 cm. Now, AC is the diameter of the circle. The circumference of a circle is 22 cm. Find its area. Let r cm be the radius of the circle. In a circle of radius 21 cm, an arc subtends an angle of 60° at the centre. Find the length of the arc. Let ACB be the given arc subtending at an angle of 60° at the centre. The minute hand of a clock is 12 cm long. Find the area swept by in it 35 minutes. The perimeter of a sector of a circle of radius 5.6 cm is 27.2 cm. Find the area of the sector. Let O be the centre of the circle with radius 5.6 cm and OACB be its sector with perimeter 27.2 cm. A chord of a circle of radius 14 cm a makes a right angle at the centre. Find the area of the sector. Let r cm be the radius of the circle and θ be the angle. In the given figure, the sectors of two concentric circles of radii 7 cm and 3.5 cm are shown. Find the area of the shaded region. 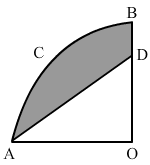 A wire when bent in the form of an equilateral triangle encloses an area of 1213cm2. If the same wire is bent into the form of a circle, what will be the area of the circle? Let a cm be the side of the equilateral triangle. Now, let r cm be the radius of the circle. The wheel of a cart is making 5 revolutions per second. If the diameter of the wheel is 84 cm, find its speed in km per hour. OACB is a quadrant of a circle with centre O and its radius is 3.5 cm. If OD = 2 cm. find the area of (i) quadrant OACB (ii) the shaded region. In the given figure, ABCD is a square each of whose sides measures 28 cm. Find the area of the shaded region. In the given figure, an equilateral triangle has been inscribed in a circle of radius 4 cm. Find the area of the shaded region. Because ∆ABC is equilateral, ∠A=∠B=∠C=60°. The minute hand of a clock is 12 cm long. Find the area of the face of the clock described by the minute hand in 35 minutes. A racetrack is in the form of a ring whose inner circumference is 352 m and outer circumference is 396 m. Find the width and the area of the track. Let r m and R m be the inner and outer boundaries, respectively. A chord of a circle of radius 30 cm makes an angle of 60° at the centre of the circle. Find the area of the minor and major segments. Let AB be the chord of a circle with centre O and radius 30 cm such that ∠AOB=60°. Four cows are tethered at the four corners of a square field of side 50 m such that the each can graze the maximum unshared area. What area will be left ungrazed? A square tank has an area of 1600 cm2. There are four semicircular plots around it. Find the cost of turfing the plots at Rs 12.50 per m2. Let a m be the side of the square.